TL;DR — DR — Having a healthy relationship with the internet is important. 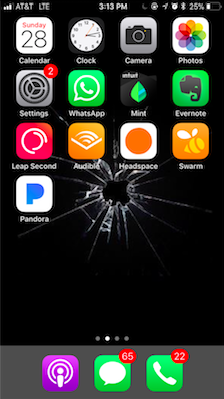 Download monitoring apps, minimize the number of push notifications, and delete time sucking apps. I deleted Instagram off my phone two years ago. Enough was enough. I noticed that I was caring more about documenting and measuring, than living and being present. As Tristan Harris, stated, “living moment to moment with the fear of missing something isn’t how we’re built to live.” Addicted to the dopamine hits, I was spending upwards of six hours on my phone daily. At first, I was struck with a bad case of FOMO — out of the loop; not being able to fill in on conversations and not getting the word about parties. Even worse, I caught my fingers moving towards the app post deletion. But then something crazy happened. I suddenly unlocked a significant amount of time in my life. Now, when it was time to write an essay I wouldn’t catch myself looking at a picture of my friend’s friend’s dog. The decision to remove Instagram was the start to a journey for a fight for my time and ultimately a healthier with relationship with the internet. Our brains weren’t designed to receive the high volume never-ending amount of input that we receive today. This new era of internet has us unconsciously hijacked from the present and stripped of our ability to do deep work. When I turn on my phone, I’m throwing myself into a playing field that thousands of oober smart people are being paid handsomely to make sure that I have an engaging and rewarding experience (aka a distraction). These distractions are disruptive, not only to our mental health but to our happiness. Here are a few ideas for how to have a healthier relationship with the internet. Without knowing how your time is spent, it’s hard to make adjustments. Moments on iOS app tells you how many minutes you’ve spent on the phone. With the pro version, the app provides you with different tools to help you learn how to use your phone less. For your computer, download RescueTime. With the free version of the application, you’ll be able to see exactly how you spent your time on the computer. To eliminate the use of distracting apps, use tools to help reduce the number of inputs. For your computer, Self Control is an application that allows you to block specific websites on your computer for a certain amount of time — once you start it, you cannot stop. Giving yourself only 20–30 minutes to access whatever is most distracting, is a powerful tool. 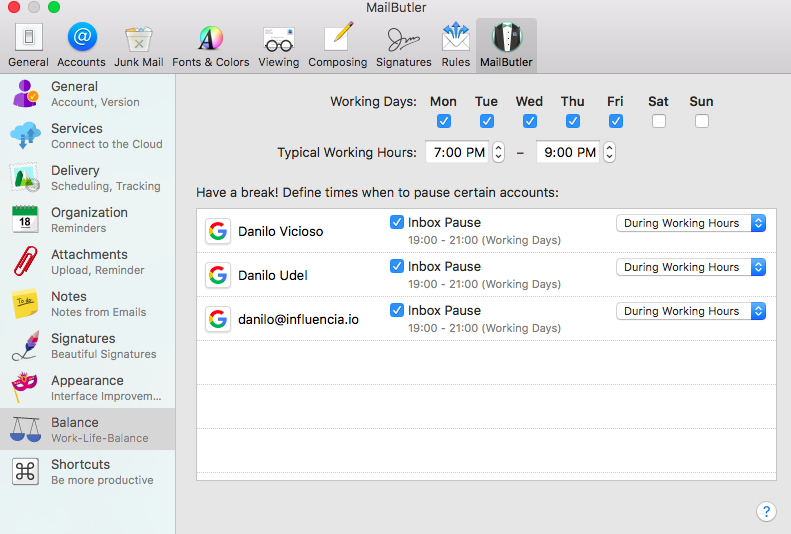 MailButler, free for most college students is a Mac email application with a variety of useful applications, including one to control when emails are allowed to enter your inbox. I’m not allowing emails to reach my inbox for most of the day. The result of that? I’m less of a slave to notifications because I have less of them. 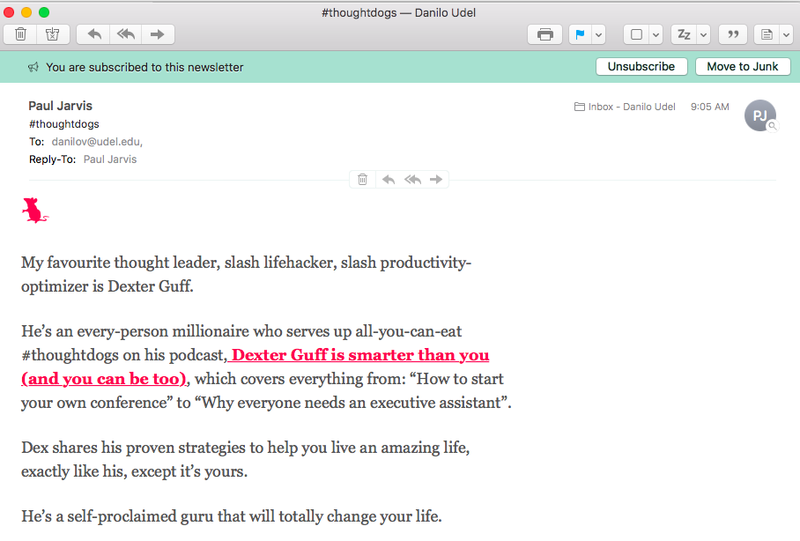 MailButler also gives you the option to unsubscribe to emails within Mac Mail. Like email, you want to remove all other notifications. Go to System Preferences → Notifications and get rid of all notifications that aren’t necessary. StayFocused for Chrome is a free extension that allows the user to set a timer for the total amount of time you can spend on all distracting apps per day. The best way to spend less time on your phone is too eliminate potential distractions. Behind every app that you’ve downloaded is a team of intelligent hard working people whose goal it is to have you spend more time on their app. The best way for them to do that is through push notifications. The more notifications you get, the more you’re tempted to go to your phone. Go to your iPhone → Settings → Notifications and you’ll be able to see which apps you have allowed to send you notifications. When making the decision on whether to disable notifications for a particular app, ask yourself what is the worst case scenario of not receiving this real-time news. Email. This one is going to seem a little controversial. While there have been times when I’ve been out and needed to access email, these times are rare, making the effect net positive. Delete any social media apps. How long does it actually take you to consume the content created on social? 10 minutes? Instead of programming yourself to constantly get dopamine hits by updating your feed, force yourself to only access it via social. Many bad things, start out as ideas meant for good. The internet and its mass manipulation is no exception.